Now that things have died down a bit after the Zack Greinke trade, I thought it would be a good idea to try and get a better idea of who the Brewers acquired last Friday. In my immediate reaction piece of Friday, I did take a look at what these three players have done thus far this season. But statistics can only tell us so much about these players. RS: Since you’ve had the pleasure of watching Segura, Hellweg, and Pena all season, what was your initial reaction when you heard about the package of players that were being sent to Milwaukee’s organization for Zack Greinke? PE: Any reaction is split into 2 categories. 1) How it affects the club I cover in Little Rock. 2) How it affect the Angels on the field. For the Travelers it’s devastating because that’s 2/5 of a very strong starting rotation and our starting SS. Segura was probably going to be returning to Little Rock over the next week to 2 weeks. For the Angels…it’s a tremendous trade in the sense they didn’t give up Richards or Bourjos and got an ace like Greinke. RS: Let’s discuss Segura, the top prospect in the Angels system at the time. What kind of player did the Brewers acquire in Segura? PE: Segura is amazingly athletic. Rifle arm. Very quick and fast. Power potential. Very strong in the core, hips, legs. Learning to be a more patient hitter and it showed in the last 5-6 weeks. RS: That’s good to hear. Even though I’m not a huge fan of player comps, does his style of play remind you of any current or former major leaguer? If so, how? PE: I’m not big on the player comps either to be honest. It’s not fair to the minor leaguer usually. Think of Segura as a guy who can play SS/2B. Give you the ability to get on base and hit for a solid OPS with some pop. RS: I think we can live with that. Based on what you’ve seen from him this year, what do you consider to be Segura’s greatest strengths on the diamond? PE: Quickness. Gets to a lot of balls on the infield. Has the chance to be a special baserunner. And I do think he can hit for some pop too. RS: Segura has faced injury issues in the past. Were there any organizational concerns that durability might be a concern with him? PE: Yes, but he’s been fine this year. RS: There have been some concerns with his ability to stay at shortstop. In his time with the Travelers, how do you think he’s handled short? Is it inevitable that he’ll have to move to 2B or do you feel that he could be a long-term SS? PE: I wouldn’t say it’s inevitable, but it’s possible for sure. RS: Moving on to Hellweg, can you give any insight about his repertoire of pitches? What does he bring to the mound? PE: Johnny has a great FB in the mid 90s. He can get it up to 100, but that’s not all the time. Very good 11-7 curve with bite and improving changeup. He’s a legit 6 foot 9. Tall and lanky. Room to grow. He’s grown 5 inches since signing. RS: Most reports on Hellweg talk about his command issues. What have you noticed about this? Is it a case of him trying to pick the corners too much or does he go through those phases when it seems like he just can’t throw it over the plate? PE: Over the last 2 months, for the most part, he commanded just fine. Troubles early, but he started to figure it out. He’s not a nibbler, that’s for sure. Competitive and hard working. A great guy and teammate. RS: With tall guys like Hellweg, one of the common problems is repeating the delivery consistently. Can you talk about his delivery at all? PE: Johnny talked about that being an issue throughout his career, especially since he’s grown 5 inches since signing. RS: You’ve been able to see Hellweg start 21 games this year for the Travelers. Gut feeling: starter or reliever? PE: Good question Ryan. I think he should be a starter right now. If the command issues creep up later on he might have to convert. 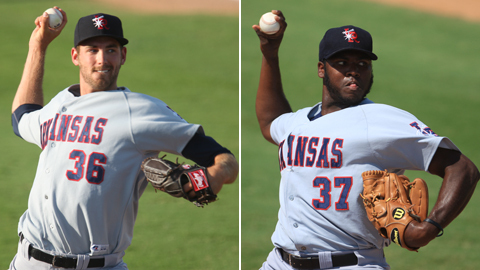 Johnny Hellweg and Ariel Pena will get a chance to show Brewers fans what they can do with AA Huntsville. RS: Finally, let’s talk about Ariel Pena. Same question as with Hellweg: what does Pena bring to the mound? What are his go-to pitches? PE: 3 very good pitches. 4-seam FB low-to-mid 90’s. Hard slider that he can slow down. Outstanding change up. Big and strong. RS: Looking through Pena’s stats for this year, his .264 BABIP jumps out at me. Does he generate a lot of groundballs or has he been on the receiving end of some luck, leading to his impressive 2.99 ERA? PE: Our home ballpark is an extreme pitcher’s park. Could be part of that. He does leave stuff up a bit much sometimes. RS: My only experience watching Pena was in the Futures Game this year, where he struggled, to say the least. After that disappointing performance, how did he bounce back in his next few starts for the Travelers? PE: He was mostly fantastic after the Futures Game. He was all smiles the next day. I wouldn’t worry about it too much. He shouldn’t have been left in that long in the Futures Game. RS: I agree on you there. Not really fair to him at all. And it’s not like the other World pitchers were blowing away the competition. With Pena, do you think he can stick as a starter or do you feel he might be more of a reliever in the long run? PE: Starter. He’s always been a starter. RS: So would you describe this trade as a win-win between these two organizations? PE: Not yet I wouldn’t. You can’t make any comparisons until this season is over and see how Greinke did. But I think the Angels must resign him because they have no depth of starting pitching in the minors. RS: Well, they’ve shown that they are willing to spend if they are winning, and I would assume they are confident they can get a deal done. That’s all I have – I’ll let you get ready for today’s game. Thanks again for doing this. We here at Cream City Cables really appreciate it. It’s nice to get a little insight on the newest members of the Milwaukee Brewers organization. We here at Cream City Cables would like to once again thank Phil Elson (@ARTravs, @ElsonPhil) for helping us out with this. 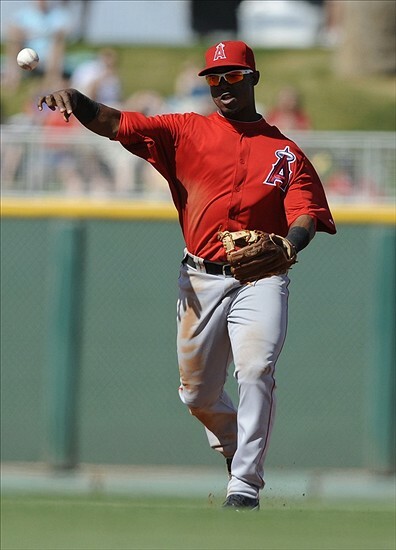 This entry was posted in News and tagged 2012 Trade Deadline, Ariel Pena, Arkansas Travelers, Cream City Cables, Huntsville, Huntsville Stars, jean segura, John Hellweg, Johnny Hellweg, Milwaukee Brewers, Milwaukee Brewers 2012, Trades, Twitter, Zack Greinke, Zack Greinke Trade. Bookmark the permalink. Welcome to Nashville Fautino De Los Santos!